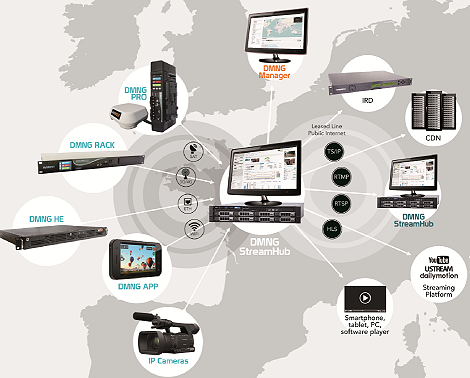 Globecast and AVIWEST team up for IP streaming solutions. Saint-Grégoire, France, February, 2016: AVIWEST, a global provider of video contribution systems, has announced that Globecast, a leading provider of global content delivery services for broadcasters and content creators, has deployed AVIWEST's DMNG StreamHub receiver, decoder, and distribution platform at its Paris hub. Utilizing the digital, mobile ENG application, common customers of Globecast and AVIWEST now have an enhanced and effective way of sharing high-quality live HD video content with other broadcasters around the world. "With 35 points of presence and 12 teleports worldwide, Globecast is dedicated to helping broadcasters deliver content across five continents. In keeping with its technology-agnostic approach, Globecast has extended and enhanced its offering to incorporate IP solutions while continuing to supply the high quality-of-service it is known for," said Marc Logez, head of marketing, global contribution at Globecast. "Adding AVIWEST technology to Globecast's arsenal of contribution and delivery services gives our customers access to alternative solutions for streaming superior quality live video." The DMNG StreamHub supports a rich set of input IP protocols, enabling reception of up to 16 concurrent incoming streams from remote AVIWEST DMNG PRO transmitters, DMNG smartphone applications, or third-party systems such as IP cameras. In addition, the DMNG StreamHub platform offers support for multiple output streaming protocols (e.g., RTMP, RTSP/RTP, HLS, TS/IP), allowing video content to be distributed over virtually any IP network. Up to 16 IP outputs can be utilized to enable re-streaming of video content over LAN or WAN to CDNs, media servers, streaming platforms, IRDs, or other DMNG StreamHub platforms. "Teaming up with Globecast, we are dramatically improving the way that broadcasters deliver live news, sports, and special events coverage," said Erwan Gasc, CEO, AVIWEST. "Based on a Linux server, the DMNG StreamHub platform offers broadcasters a reliable, flexible, and simple transmission method for streaming high-quality video content anywhere in the world."